I don’t usually care for hotel restaurants. To me, they have always been kind of “blah”. Because it was starting to get chilly out, and honestly, we were sick of walking around Hartford (my friend’s fitness app has tracked us at over ten miles walking in two days), we decided to give the M & M Bistro inside the Hilton Hotel a try. While it was better than I expected, there was still something generic about the whole experience. One bit of creativity I will give them is a “Presidential Candidate Burger Challenge”, where they had a burger named for (and very loosely connected to) current candidates such as Donald Trump, Hilary Clinton, Bernie Sanders, and Ted Cruz. It was primary season during my visit. For example, the Sanders Burger was topped with jalapenos so you can “Feel the Bern”. The Cruz burger had Canadian bacon. The others were pushing it. 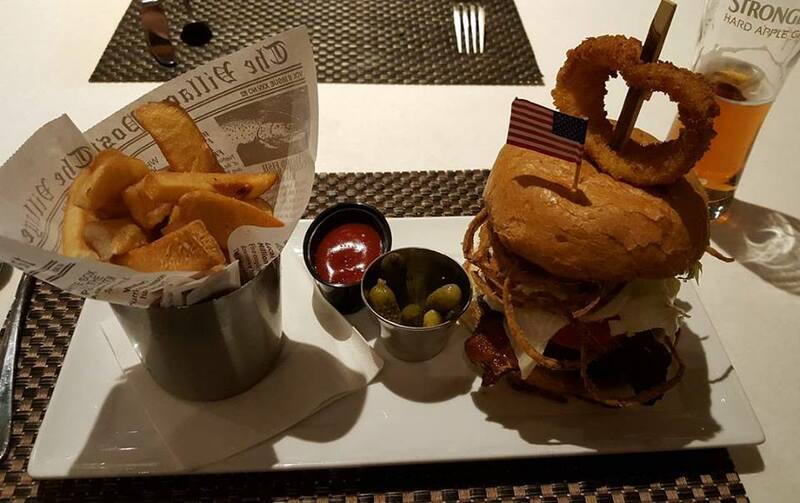 In any event, we both ordered the Trump Burger (he was in first place on the leaderboard), which came topped with bacon, onion straws, lettuce, tomato, and bacon-mayo. I made sure to joke with the waitress that my choice of burger did not necessarily correlate with my own political views. She chuckled. Ironically enough, this burger challenge proved prophetic. The burgers were both ordered medium, but when they arrived I could tell they were well. Actually, they looked so well-done that I was wondering if they would be better used as hockey pucks at the XL Center across the street for the next day’s Wolfpack game. However, they were surprisingly juicy, and we were satisfied. 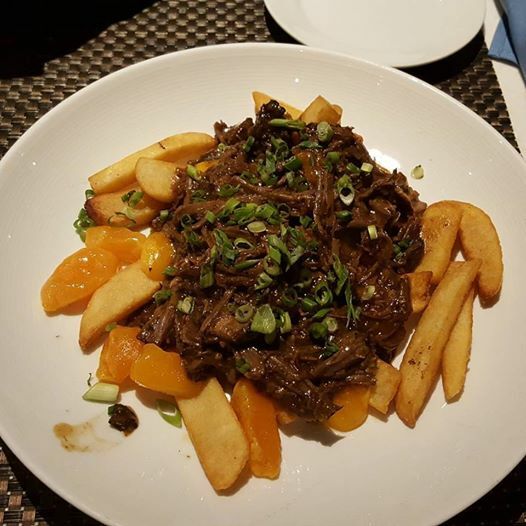 Our appetizer was a short ribs poutine—steak fries topped with short ribs, gravy, and cheese curds. This was indeed very good, though most of the curds were not melted in and sat around the edge of the plate as clumps looking more like orange slices than cheese. Prices were hit or miss. A tall pint of Yuengling was $5 while the poutine was $15 (though it was big enough to be a meal in itself—so I’m not really complaining) and all burgers were $16. I’m going to rate this a 3.5 out of 5 stars. It was so close to getting 4, but aside from the sheer convenience of it all, the meal was unspectacular and I would not recommend unless you were in similar circumstances. Still, they get points for creativity. This review was originally posted here. The M & M Bistro is located inside the Hilton Hartford at 315 Trumbull Street in Hartford, Connecticut.